It’s very difficult not to fall into this temptation right now because it is so enticing…everyone loves awoof most especially if there is no any limitation to it. The awoof stuffs have been seeing of late is majorly for new customers but this offer, is for old and new customers. 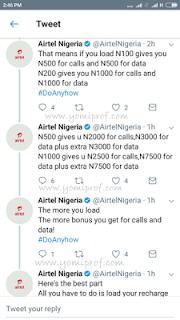 Airtel smartRecharge is a new offer from the Airtel NG that gives you 10 times more on your recharge for voice and data. Unlike Airtelsmart connect 2.0 that gives 6x more on the amount you are recharging. For instance, if you recharge N100, you’ll get N500 for calls and N500 for data. A recharge of N200 will give you N1000 for calls and N1000 for data. N500 recharge give N2000 for calls, N3000 for data plus extra N3000 for data. While N1000 recharge will give you a whooping N2500 for calls, N7500 for data plus extra N7500 for data. The more you load the more bonuses you get for calls and data. Now you understand what I’m saying that this smartRecharge is absolutely enticing and the good part of it is that its available for all Airtel Subscribers. Any Airtel sim will do the magic recharge above. How Can I Get Airtel Super Recharge? This offer is open to new and existing subscribers on Airtel network. 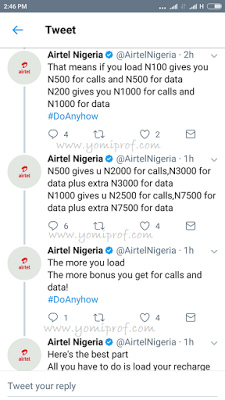 This is why Airtel calls it #DoAnyhow.